Local nonprofit, Trails & Vistas, brings artists, dancers, and musicians from all over the world to our area each year for a series of unforgettable events. Their mission is to create community by celebrating the arts and nature. They do this by collaborating with artists, poets, conservationists, educators, writers, as well as art and environmental nonprofits. Build a thriving rural culture that inspires arts activity, provides economic activity with ecotourism, builds pride of place, and inspires environmental awareness. Trails & Vistas partner organizations include the Truckee Donner Land Trust, the Nevada State Parks, the Lake Tahoe Shakespeare Festival, Arts in Wellness, the KidZone Museum, InnerRhythms Dance Theater, North Tahoe Arts, and For Goodness Sake, to name a few. Here’s a sampling of their upcoming events. There’s sure to be one that catches your eye! If you love food, wine, music and art, you’re in for a very special treat – also on July 15th. Trails and Vistas presents “Taste & Listen”. In this delicious conceptual piece, artist, Nancy Tieken Lopez, Executive Director and founder of Trails and Vista, invites the visitor to interact with culinary arts in a more sociable way, and blurs the distance between artist and viewer. You aren’t just listening to the music as a backdrop, but you are part of it””and are, in fact, making the art as you eat a delicious meal while you enjoy an evening with friends and new acquaintances. Join along with the artists, the Stella Kitchen Team as they feature spices and foods inspired by the music of India, Spain and Africa for an unforgettable meal and artistic experience. Other summer events for Trails and Vistas include guided hikes showcasing the Truckee Donner Land Trust land acquisitions and open space trails in the summer months, with upcoming hikes at Webber Lake and Lacy Meadows on July 15th and the Independence Lake Preserve of August 12th, with kayaking available for participants. Trails & Vistas celebrates Art, Earth and Sky with guided art hikes through the majestic natural scenery of the Sierra. Now in its 12th year, Trails & Vistas signature event is a guided art hike with dance, poetry, music, storytelling and environmental art with family, leisure and meditative hikes. This year there will be two separate hikes and locations. On September 10th, the hike will take place on the North Canyon Trail, in the Spooner Lake area on the Nevada side of Lake Tahoe. This is a new trail for the event, and it promises to be the best one yet. The very next weekend, on September 18th, the hike will return to Donner Summit, just outside of Truckee, on yet another new trail and featuring different artists/installations than the previous weeks’ hike. 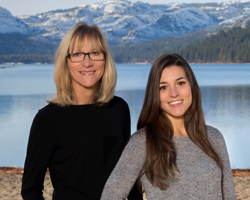 Artists from the first weekends hike at Spooner Lake will also perform at the World Concert that Saturday night the 10th, being held at the world renown Sand Harbor stage, home of the Lake Tahoe Shakespeare Festival. Trails & Vistas World Concert: A Peace Project of Truckee Tahoe will close out the world class Shakespeare at Lake Tahoe Encore Series with rhythms and beats with music styles from around the world. The lineup includes local favorite Emily Tessmer, Peter Joseph Burt, Motoshi Kosako, Jessica Fichot, and headliner, Todo Mundo. Lastly, as we enter the fall, a Truckee institution enters the scene, the Haunted Historical Tour. Visitors from as far away as the east coast, the mid-west and LA, and as nearby as right here in Truckee/Tahoe, Reno, Sacramento and the San Francisco Bay Area become immersed in engaging tales performed by talented characters at six interesting historic sites in the downtown Truckee area. Each year the highly anticipated performances take place in new featured haunts. Writers skillfully weave together dramatic, downright haunting and funny stories inspired by times of yore, this Tour is complete with treats and tricks. It’s rowdy fun and takes place on two October nights, the 13th and 14th. From unforgettable Art Hikes, a World Concert, art workshops, to immersive arts-in-nature field trips for local students, Trails & Vistas embraces the magic of creativity in the Sierra. There are so many options for you to join them in celebrating this special place. You won’t be sorry!